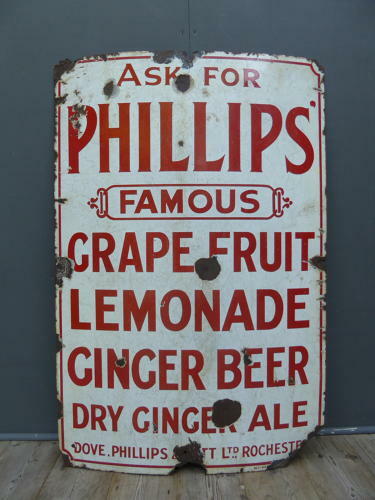 A beautiful early antique enamel advertising sign for Phillips 'Famous' soft drinks. A scarce surviving example featuring some wonderful typography & wording with a stunning overall look about it. Simple, striking & perfect for a kitchen, cafe or restaurant. Around 1890 /1900 in date. Wear commensurate with age as pictured. Unrestored with loss to the lower right corner which does not detract.